It is strange, then, that the Greek people were largely absent from proceedings. A security lockdown stifled any protests or other expressions of opinion. This absence was compounded by the immature stance of locally elected politicians, such as SYRIZA’s Alexis Tsipras and Democratic Left’s Fotis Kouvelis, who deliberately avoided the ceremony. Also, the European Parliament, the body that Greeks help elect, was without a voice at proceedings as its vice president, Anni Podimata, was prevented from speaking on grounds of protocol when President Martin Schulz was unable to attend. Wednesday’s event was not the first time that the European Parliament was snubbed. Earlier in the week, Prime Minister Antonis Samaras and Schulz agreed that MEPs heading an inquiry into the role of the troika should not carry out a scheduled visit to Athens. Their visit was eventually rescheduled for the end of this month but the message to Greeks was that the presence of the MEPs would be an irritation, which would interfere with the formalities of the presidency. It certainly made Van Rompuy’s assertion that Europe is “a constant endeavour, a collective work that deserves our efforts and our attention, day after day after day” ring a little hollow. Certainly, the European Parliament’s troika inquiry is no panacea. It will not make today’s pressing problems disappear, nor will it heal the impact of any mistakes made in the past. Nevertheless, after almost four years of monumental decisions being taken behind closed doors, without consultation and outside the legal framework of the European Union, an investigation into how the eurozone bailouts have been constructed and implemented has been long overdue. The inquiry, led by Othmar Karas, an Austrian member of the EPP group, and Liem Hoang Ngoc, a French member of the S&D group, has the authority to conduct public hearings with key institutional figures and to visit the periphery countries to get a different perspective on how the bailouts are working, or not . Since the euro crisis began, the European Parliament has been marginalised. The Eurogroup has been the main decision-making vehicle. German Finance Minister Wolfgang Schaeuble argued recently that this was absolutely logical and not in conflict with democratic principles as each country is represented by their finance minister. A carbon copy response was given by German Foreign Minister Frank-Walter Steinmeier when he was in Athens last week. This is a thin argument, given that it ignores the role that EU institutions are supposed to fulfil and that there should be a clear distinction between this and national responsibilities. It does not even begin to address the fact that the troika programmes are not bound by the Charter of Fundamental Rights of the European Union, as the troika inquiry outlined in its draft report. Appearing at a troika inquiry hearing on Monday, European Economic and Monetary Affairs Commissioner Olli Rehn argued that national parliaments get ultimate approval of the bailout deals. This conveniently disregards the fact that MPs in bailout countries vote under extreme duress. In February 2012, Greek MPs had two days to read around 800 pages that made up the second EU-IMF memorandum before voting on whether to approve the bailout deal. The MEPs on the troika panel are trying to chisel away at this stubbornness, to carve out a role for the European Parliament – the only EU institution that has a direct link to voters – in decisions that impact on millions of lives and are key to shaping Europe’s future. "By launching an enquiry into the work undertaken by the Troika, MEPs have assumed a crucial and delicate task,” said Juergen Klute, an MEP, with the GUE/NGL group. “Since the start of the inquiry the European Council and the IMF have made it clear that they are not interested in democratic accountability and transparency." Its public hearings may carry little more potency than a hostile press conference but for many the troika inquiry is an opportunity to make a stand against decisions resting just in the hands of an elite that has little accountability. "For decisions that affect Europe as a whole, the European Parliament has to have a say,” Karas said during a visit to Portugal last week. “It is not enough to say that because national governments are democratically elected, we do not need the European Parliament any longer. That would turn the European clock back decades. There is an alarming laxity among key EU officials and some national politicians about the consequences of the way the bailouts have been handled. They appear blind to, or at least unwilling to see, the resentment and mistrust that has built up in the eurozone periphery in particular. A Gallup poll published last week, however, set out the disturbing reality that trust is evaporating by the day. In Greece, for example, approval of the EU leadership stood at 60 percent in 2009 but plummeted to 19 percent last year – the lowest rating in the Union. There have been similarly dramatic drops during this time in the other countries that have been bailed out: From 39 to 21 percent in Cyprus, 55 to 27 in Spain, 40 to 31 in Portugal and from 70 percent in 2008 in Ireland to 47 percent last year. However, it would be wrong to believe that the alarm bells for the EU should be ringing just in the periphery. 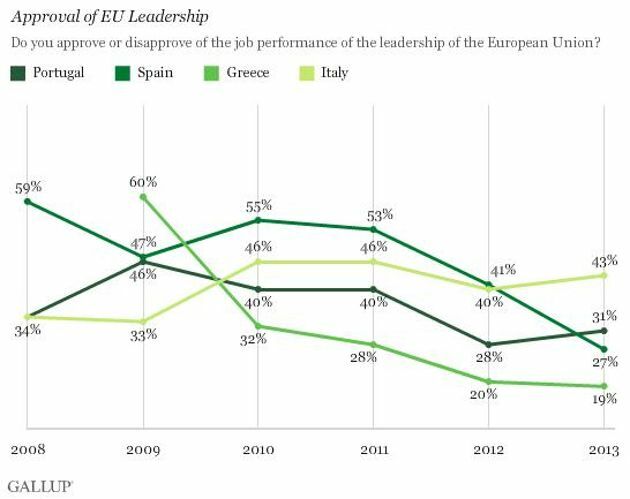 In fact, the Gallup survey indicates that approval of the EU leadership has dropped in 20 of the 28 member states over the last few years. While young people, aged between 15 and 30, remain the strongest supporters of the EU, this age group has also seen a significant decline. Approval for the EU leadership among young Greeks fell from 61 percent in 2009 to 19 percent last year but France, for instance, also experienced 17 percentage point drop to 47 percent since 2008. This growing disconnect is a compelling reason for which Europe should be welcoming the troika inquiry. It is a first step in the attempt to claw back some transparency and accountability. 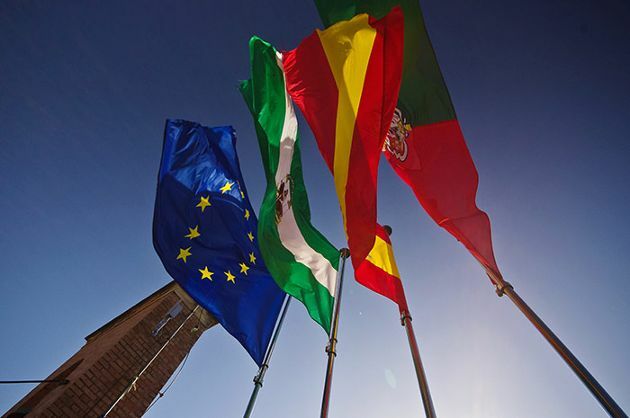 However, with European Parliament elections coming up in May as discontent and euroscepticism festers in much of the EU, it is likely to prove too little to late. During the euro crisis, EU officials have dismissed at their peril the growing voices of discontent. But these are not just complaints about austerity or a lack of jobs, they are also cries of existential angst about the way the EU’s institutions operate and how decisions are made. May’s elections could be the moment the EU realises that it can no longer afford to shut out its own citizens. Eleni, while it is you're right as a citizen to voice your disapproval, surely a politician cannot just opt out. Tsipras is aiming to be prime minister - what will he do when the first EU summit comes up? Boycott that as well? If his government doesn't get what it wants from its eurozone partners, will his finance minister picket the Eurogroup meetings? Tsipras and Kouvelis have made their views very well known and have no shortage of outlets to express concerns about the EU, euro, or whatever it may be. I don't see any reason why attending the opening ceremony of the EU presidency compromises their position. Whether they like it or not, Greece continues to be part of this flawed structure. They only way to change this is by working from within. The other option is to leave, as Alekos Alavanos advocates. Having not chosen this option, Tsipras and Kouvelis do not have the luxury of being absent. Surely, their role must be to argue their case and Greece's case at every opportunity they are given. I understand your point that local politics should be put aside at EU ceremonies, and normally would agree. Yet these are anything BUT 'normal times' and Tsipras & Kouvelis no doubt judged that their 'supporting' presence would not play well with their voters. To voters like myself who do not support the government, the Troika, the irresponsible and predatory memoranda or the unelected, unrepresentative and wholly unaccountable EU commission, the absence of Fotis Kouvelis and Alexis Tsipras was perfectly understandable and commendable. Be careful, because I am no hothead ideologue but a middle-aged, middle-class, non-unionised centrist voter. Their decision would be exactly my decision. "In February 2012, Greek MPs had two days to read around 800 pages that made up the second EU-IMF memorandum before voting on whether to approve the bailout deal". Welcome to the club! I remember German MPs were exactly in the same situation every time a rescue package had to be approved. I remember one time where ARD (or ZDF?) interviewed MPs after the vote to check whether they knew what they had approved. A great portion of them (including very prominent MPs!) had absolutely no idea. They couldn't even tell the amount of the rescue package which they had just approved. The entire political system is flawed, full of nepotism and corruption. Tsirpas et all have rhetoric with no solutions, the Government are captive of the lenders and the people are suffering. Our systems were never suited to the EU, and we should never joined. Contemplate restoring the Constitutional Monarchy, and destroy the system that was born in 1974! !